This supplement clocks in at 32 pages,1 page front cover, 1 page inside of front cover, 1 page editorial, 1 page SRD, 1 page ToC, 2 pages of introduction, 2 pages of advertisement, 1 page inside of back cover, 1 page back cover, leaving us with 21 pages of content, so let us take a look, shall we? Okay, so mental illness is a serious topic – and as such, the book prefaces the discussion of the subject matter with an appropriate and mature disclaimer, before we take a look at the material herein. 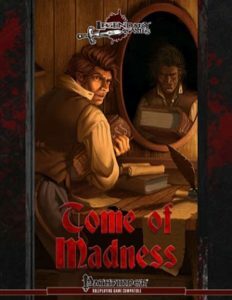 The pdf proceeds to acknowledge the changed paradigm of a world with readily available (as opposed to obscure) magic and codifies madness as maladies. Now, as we all know, there are a wide variety of effects in vanilla Pathfinder, effects which ostensibly would qualify for causing madness in e.g. the context of CoC or similar, darker RPGs. Hence, the pdf proceeds to quantify and qualify them – from mental attribute damage to divinations, special spells, types of forbidden knowledge etc., the pdf explains and codifies these in a concise and sensible manner. Different types of trauma and their effects. Creatures immune to mind-affecting effects “gain a boost” (should be a bonus) to saves to prevent them – this bonus is calculated as 1 + Charisma modifier and can thus be undertaken on the fly. Speaking of which: Exposure to trauma can similarly easily be calculated – as a Will-save versus 10 + the CR. Failing such a save results in rolling on a d%-table; onset of maladies (the term employed for madnesses herein to set them apart from other systems) is delayed by 1d20 -1 hours. Mental ability score damage or drain to 0 adds 15 to the result and pre-existing conditions can mean that the condition has worsened by one step. The system knows three types of severity: Mild, moderate and severe. Maladies are codified in a variety of general concepts: Amnesia, Delusions, Dementia, Hallucinations, Phobias and Tics – these are properly discussed. Minor formal complaint: The pdf introduces the terrified fear-condition – which is also a greater feat step (level 6) in the expanded fear-system championed by Horror Adventures – since both versions of terrified have different effects, I wasn’t too enamored by the nomenclature here. That being said, the condition is per se interesting, though the fixed DC to act or utter a single word feels a bit odd – a scaling DC would have made more sense in my book. But the main meat of the book would be the maladies themselves: They are roughly grouped in two types: Neurosis and psychosis. Generally, a neurosis tends to be more easily manageable. The stats for the respective maladies include save DCs for all severity levels and triggers – the circumstances where their effects become relevant. The triggers provided are proximity, random and stressor. Maladies have durations for their effects. Now, the maladies included run a wide array of options: Characters can e.g. suffer from akinetopsia, a form of motion blindness, problems deciphering letters or pictographic writing (read too many mad glyphs, did ya? ), anterograde and retrograde amnesia, compulsions, aphasia, catatonic stupors, deliriums, various delusions (which are chronic), fits of despair, dysparaxia – and I’m just getting started here. From tactile hallucinations to various, sense-based hallucinations to hypochondriasis, hysterical blindness/deafness, classic insomnia, intentional tremors, intermittent bouts of rage, kleptomania, manic episodes, panic attacks, paranoid ideations and various tics complement the rules provided for them. As a whole, the rules-language is very precise and well-crafted here, though, aesthetically, the wording of “assuming the XYZ condition” that the pdf employs is something that galls me on an aesthetic level – as a dev, I’d have streamlined that. It should also be noted that, while fitting in a section on madness, a militaristic man with a read flag, a white circle in it and the black sun inside that white circle (i.e. a Nazi) can be found here – it looks like a propaganda poster and while I would have expected something like megalomania here, instead the page features tics etc. – perhaps not the best choice. The second array of maladies is primarily focused on NPC-use – global amnesia could, however, be easily used as a basis for a specific campaign/one-shot and disassociated identities and psychogenic fugues pose some rather significant consequences for characters that really hamper the playability – the restriction of these to NPCs makes sense and certain campaigns can still make use of them. The question of the treatment of madness, both via skill unlocks and regarding auras – interesting here: The higher your Charisma score, the harder treatment for soothing purposes becomes. Alchemists can learn psychopharmacology and hallucinogenic bombs. Really cool: The pdf does contain various items, which may feature side-effects and craft DCs – intriguing here: The rules crossover with ioun stones in an intriguing manner. The book also provides simple and quick rules for decompensation, the gradual worsening of untreated maladies, and additions. The pdf concludes with some advice for the GM. Editing and formatting are very good on a formal level. On a rules-language level, the material is similarly neat, but does sport a couple aesthetic deviations from the standards, though these do not hamper the usefulness of the pdf. Layout adheres to the great 2-column full-color standard for LG’s horror-books. The artwork featured herein mostly should be familiar to fans of LG and fits the theme in a broad sense, with the one picture exception. The pdf comes fully bookmarked for your convenience. Mike Shel’s malady-system is exceedingly modular and easy to integrate into just about any system. The lack of requirements of an extra score is a big plus, as is the easy way in which it can be implemented in an ongoing campaign that suddenly takes a turn for the horrific or that just dabbles in themes of horror. As a whole, I consider it to be more elegant than the system championed in Horror Adventures. The system presented is different from the one featured in LG’s previous Gothic Horror plug-ins, so if you expected a direct sequel/more fodder for the system, you won’t find that herein. On a formal level, I found myself rereading the basics a couple of times – didactically, the system could be explained a bit ore succinctly, which represents the most significant structural weakness of the pdf – novice GMs may be a bit confused in the beginning, also due to the subcategories/subtypes having less mechanical impact than they could have exhibited. That being said, I am complaining at a high level here. The comprehensive nature and easily implemented structure of this system makes it more than worth checking out – you see, due to the relative simplicity and flexibility/severity-levels of the system, it is rather simple to graft this system on other sanity-engines or implement it on the fly. As such, this represents a welcome addition to the library of GMs intrigued in the horrific. This is, hence, worth a final verdict of 4.5 stars, rounded up for the purpose of this platform. You can get this easy-to-implement madness-system here on OBS! Liek weird critters? need something to cause madness? Why not check out LG’s Kickstarter for an Alien Bestiary (PFRPG/SFRPG/5e)? The KS has 4 days to go as per the writing of this review. You can find it here!